“Now, what was the name of that recipe that I found using Pinterest? I just know I’ve made it before…”. Is this you? Pinterest. I love Pinterest for finding recipes. But, then there is the problem that there. are. so. many. recipes to try. Right? This was a weekly struggle until I made a DIY Recipe Binder. In typical form, I chose to organize recipes simply. If it isn’t simple, I won’t keep the habit. I know that about myself. This binder contains recipes that I’ve found online or in a magazine. It does not include family recipes. I do have family recipe cards that were part of a wedding gift, but those are kept in a separate recipe book. The online recipes didn’t fit into the family recipe book and would have to be reformatted. Sometimes, I’d stick recipes in the family book “to try” and end up not being a huge fan. However, I really consider the recipes in my family book to be iconic, well-loved, recipes. 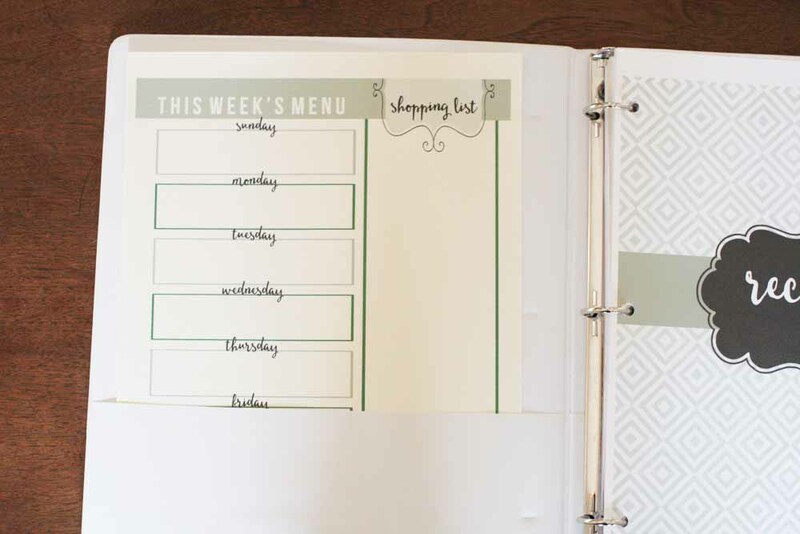 All that to say, there is no reason you couldn’t store everything in one recipe binder. 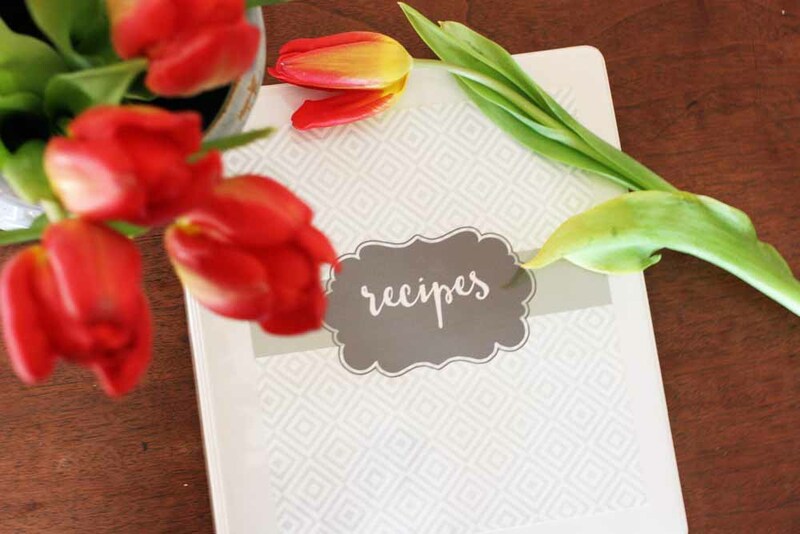 Yet, if you’re like me, a recipe binder is a very simple, flexible, method for storing recipes — even it’s not the only place you keep recipes. Those are my Valentine’s flowers, ya’ll! Less than $3 at Aldi’s. They are looking lovely in our breakfast nook, and perfect for this photo shoot. So, are you convinced? 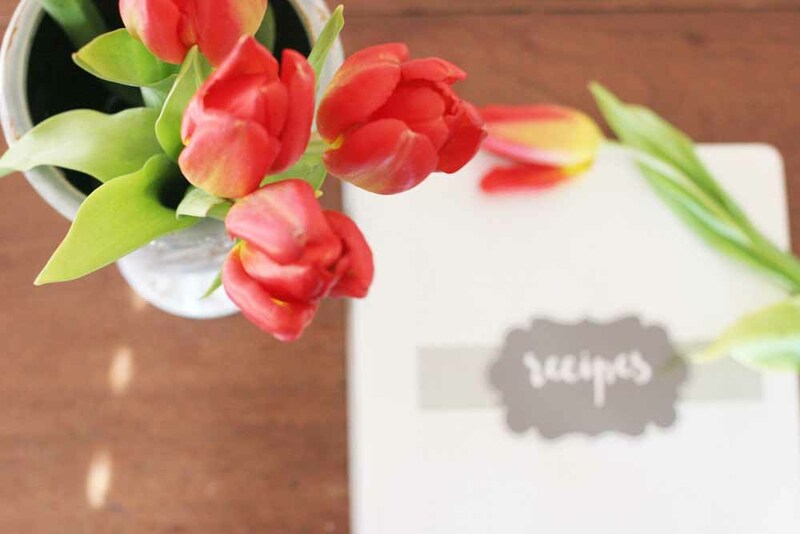 Do you need a simple method to organize recipes? 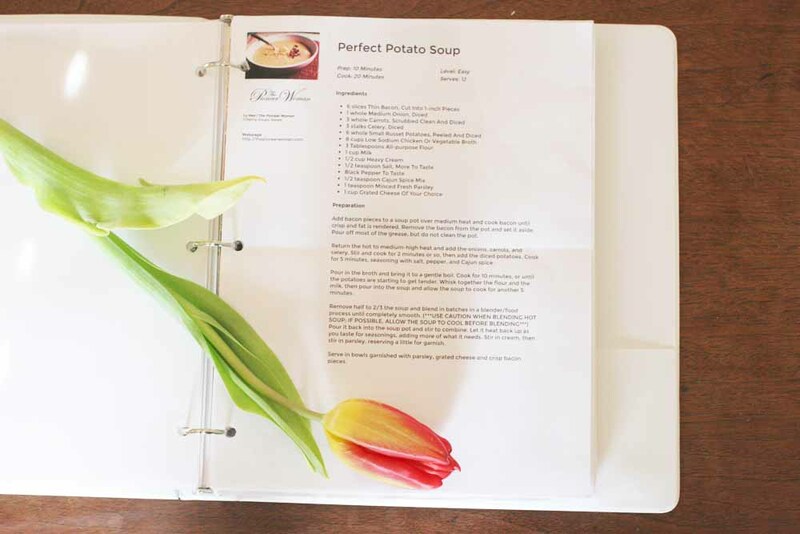 If a recipe prints as a full-page, 3-hole-punch the sheet and stick it into the binder. 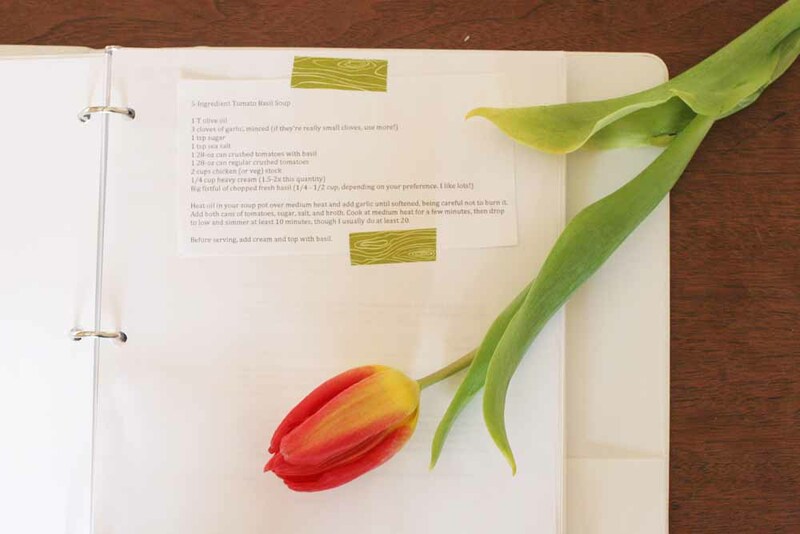 If the online recipe prints out as a “card” – typically 4×6 – then cut it out and tape it onto a blank sheet. 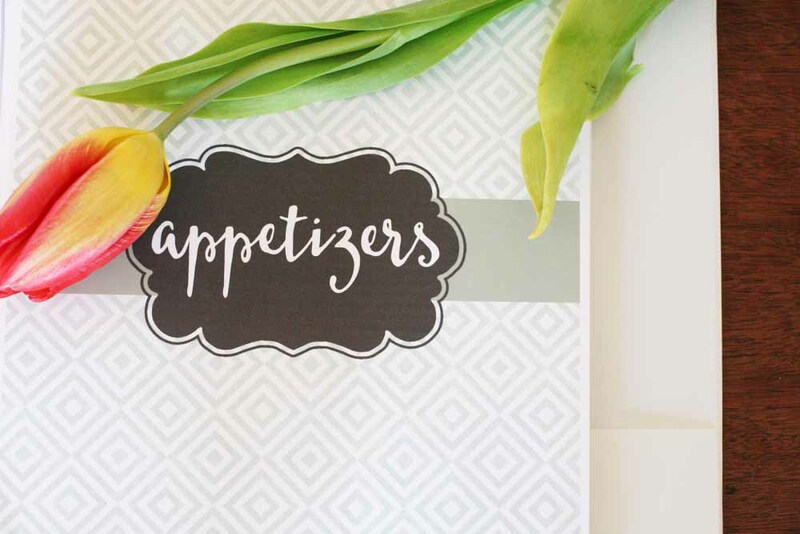 Keep several blank sheets inside each recipe category for this purpose. Try using washi tape to attach the cards, for a little color and fun. 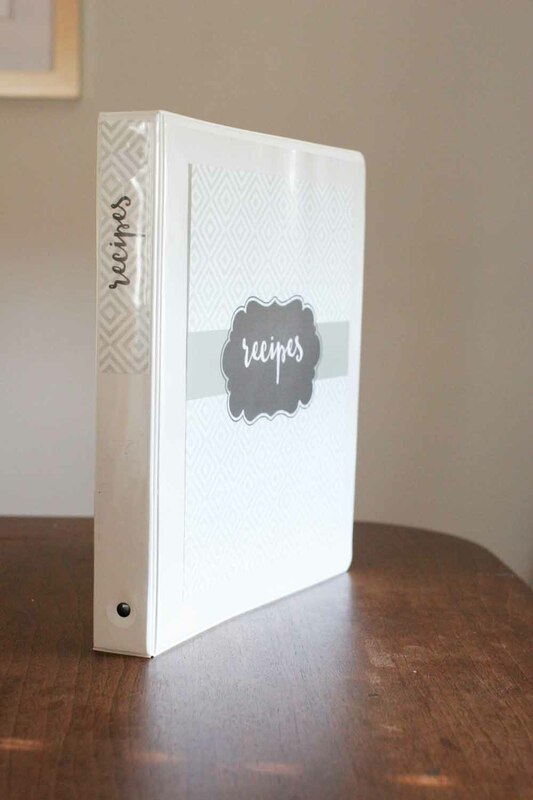 The printable set also includes a “recipe” label for the binding. The label holder on my binder was stubborn. Due to a tight fit, I could only get a half-size sheet into the label holder. The binding label is designed to fit binders of widths equal to, or larger than, 1 inch — just trim the label sheet accordingly. How do you organize recipes? I’d love to hear what works for you. This is a great little binder Lora! I’ve been meaning to put something like this together because I think I have at least 4 places I keep recipes and it would be nice to consolidate. That’s how mine were before, but once I put together this binder last year, I’ve stuck with it. It’s just so simple that I don’t skip putting recipes in the right spot. This is SUCH a great idea. I’ll make recipes on Pinterest and forget to pin or save them then have no idea what I made in a few weeks haha. I should print them out and put them in a pretty binder!! This is such a great idea, Lora! I used to have a binder (for recipes, grocery, lists, coupons) sort of like that except mine was nothing designed. I created plane lines then printed them out on regular paper. Now I just have a notebook that I keep everything in! I love your design and that is a great way to keep things organized for cooking and shopping.